Oak Creek, Wisconsin-March 26, 2019- AW-Lake Company introduces its new PCU Series of Controllers that connect with Vogtlin or any thermal mass flow meter or controller to provide a local display of flow output. Serving as a single or multi-channel mass flow controller with up to four channels, the PCU instruments support multiple unit networked operations. A large, high-contrast backlit display offers easy-to-read views of process variables and programmed setpoints for each connected device on one screen. Configurable from a keypad or using an RS-232 connection to a computer or PLC, the PCU Controllers offer remote readout, setpoint control, and data acquisition capabilities. Built-in diagnostics ensure trouble-free operation by testing system operating status, memory condition, communication adapter status, display functionality, and keypad operation at every power-up. PCU Series of Controllers are available in multiple configurations including panel mount, tabletop, and DIN Rail. Units meet environmental compliance for RoHS EPD 2011/65/EU and UL-UA and Canada UL 61010. Panel mounted units are NEMA 4x rated for protection against environmental conditions such as rain, snow and ice. The PCU Controllers operate from 15 to 24 V DC and provide a variety of voltage or current outputs. Operating temperatures range from 32◦ to 104◦F (0◦ to 40◦C). 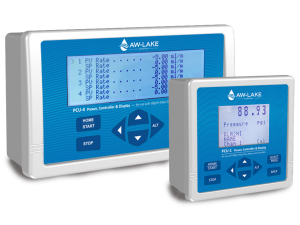 For more information, visit the website at https://aw-lake.com/product/pcu/ or contact Marcia Reiff, Marketing Manager, at 800-850-6110, e-mail mreiff@aw-lake.com.